Disconnect the negative battery cable. Refer toBattery Negative Cable Disconnection and Connection.Reposition the positive battery cable boot at the generatorterminal.Disconnect the engine harness electricalconnector-(1) from the generator.Remove the positive battery cable nut-(2) at thegenerator.Remove the positive battery cable terminal-(3)from the generator.Remove the drive belt. Refer toDrive Belt Replacement. 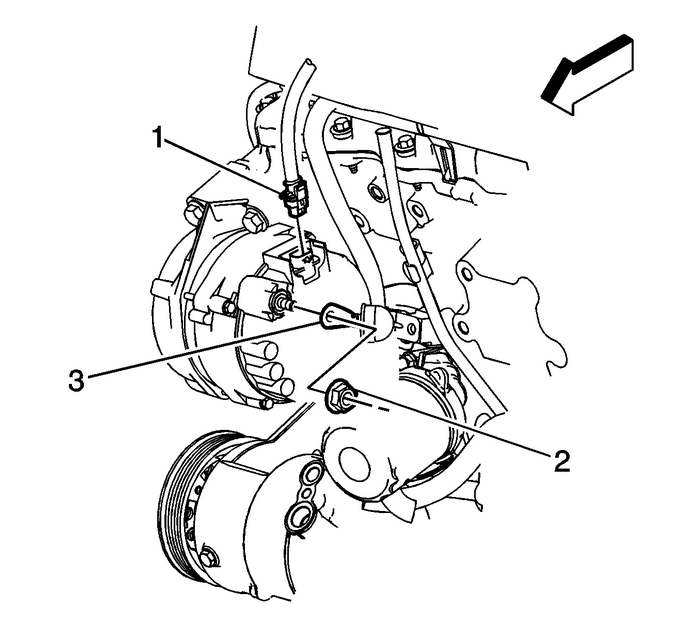 Remove the idler pulley bolt-(1) and idlerpulley-(2). 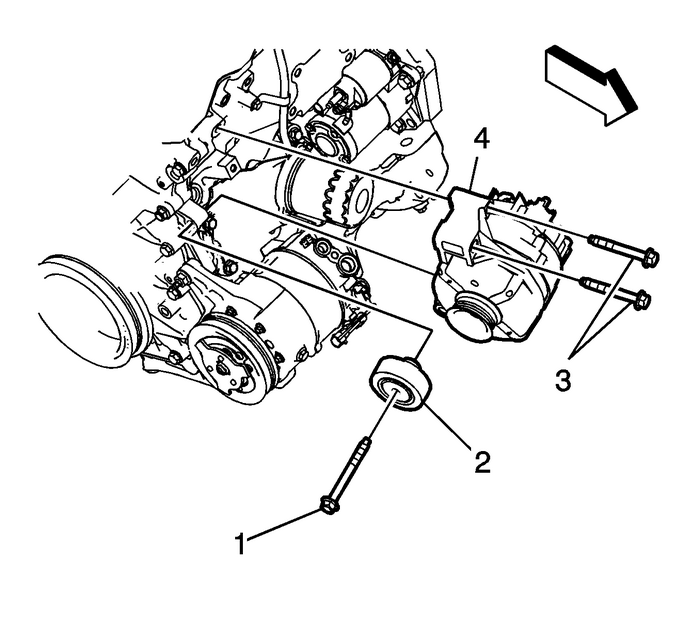 Refer toDrive Belt Idler Pulley Replacement.Remove the generator bolts-(3). Note:When removing the generator from the vehicle, it may benecessary to maneuver the generator to remove it from thevehicle. Position the generator (4) to the engine.Loosely install the generator bolts (3).Install the idler pulley. Refer toDrive Belt Idler Pulley Replacement. Tighten the generator bolts to50-Y(37-lb-ft). Install the drive belt. Refer toDrive Belt Replacement.Connect the engine harness electricalconnector-(1) to the generator.Install the positive battery cable terminal-(3) tothe generator.Install the positive battery cable nut-(2) at thegenerator and tighten to20-Y(15-lb-ft).Position the positive battery cable boot at the generatorterminal.Connect the negative battery cable. Refer toBattery Negative Cable Disconnection and Connection.